Wigan have completed the signing of Newcastle winger Charles N'Zogbia. The deal sees Wigan defender Ryan Taylor, 24, join the Magpies, with the Latics also paying a fee understood to be around £6m for 22-year-old N'Zogbia. Manager Steve Bruce told his club's website: "Charles is exactly the type of player we need for the long term building of Wigan Athletic. "He's lightening fast going forward but can also play at the back and fills the left-sided role we were looking for." 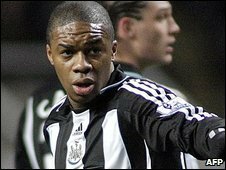 N'Zogbia joined Newcastle in 2004 from French club Le Havre and signed a new five-year contract at St James' Park in 2007. But he insisted he would never play for Newcastle again after manager Joe Kinnear pronounced his name wrong. Kinnear called N'Zogbia, "Insomnia", in an interview after the Manchester City defeat on Wednesday. The Frenchman received support from the Professional Footballers' Association chief executive Gordon Taylor, who described Kinnear's comments as "disrespectful and at worst deeply offensive". Taylor added: "The word (insomnia) gives the media a stick with which to beat the lad." Bruce has been one of the busiest managers in the transfer window, with Taylor, Wilson Palacios, Emile Heskey, Henri Camara and Kevin Kilbane all leaving and N'Zogbia, Mido, Hugo Rodallega and Ben Watson arriving. All that pain he has inflicted on Newcastle in the past has probably brought him a move there. The Latics boss feels a move to St James' Park is the right one for Taylor, who joined Wigan from Tranmere in 2006. "It was one of those decisions that was quite easy to make in the circumstances," Bruce explained. "Newcastle have made him a fantastic offer and I know he has bee angling to try to play in his preferred position on the right side, which we haven't been able to do very regularly. "He is a superb striker of the ball and it is ironic how this game works sometimes. All that pain he has inflicted on Newcastle in the past (by scoring four goals in four games against the Magpies) has probably brought him a move there. "He was always totally professional here and I wish him all the best in his new career."